Last Update: September 26, 2015. 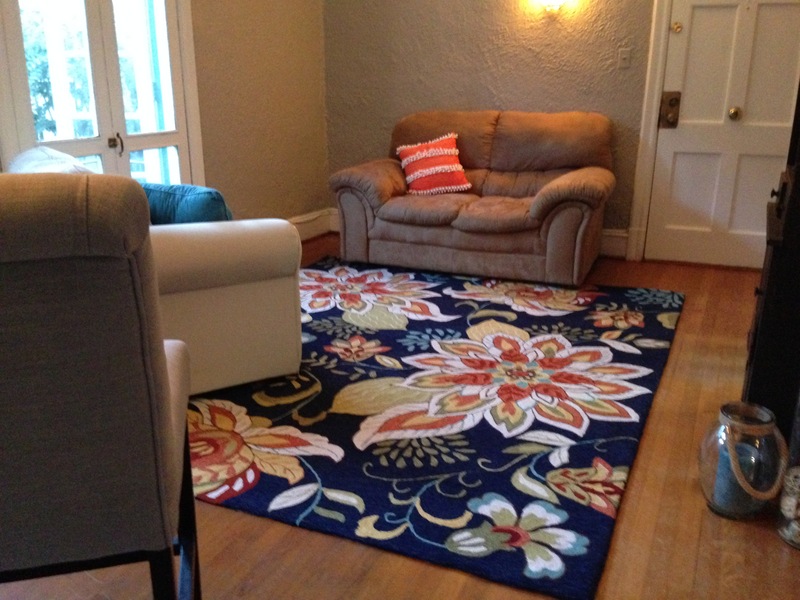 It’s up for debate whether this is a living room, family room, drawing room, or sitting room. When you only have 700 square feet, I guess you call it what you want. We don’t actually have a name for ours–I guess it’s ‘the big room.’ Anyway–here’s what it looked like on day 1. 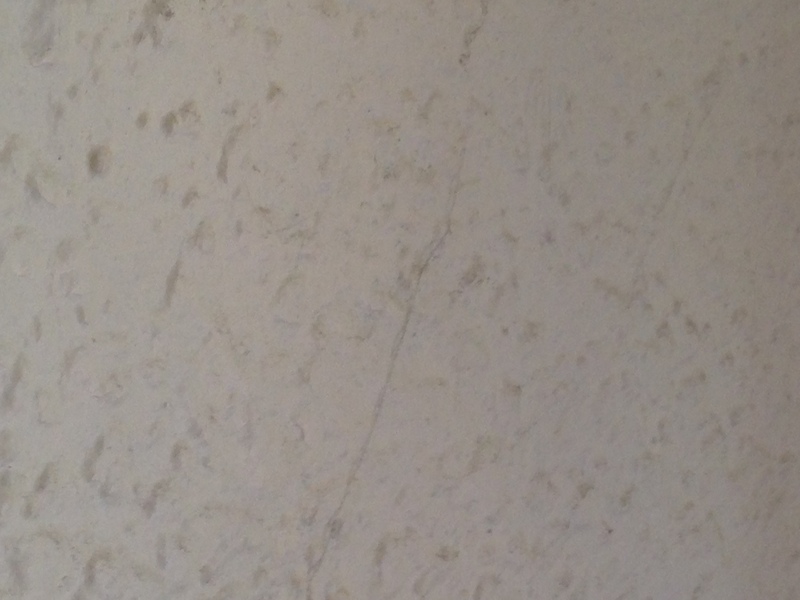 The wall looks like it has the pox, and an overall unevenness. 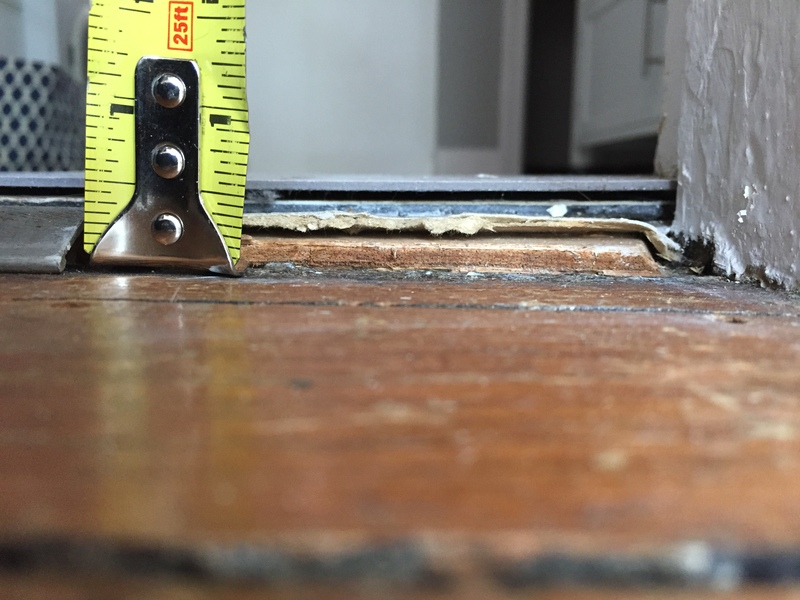 We don’t really mind the hardwood floor being messed up like this–generally, it has issues from where it’s been most walked on, potentially by shoes and the dog, and also on the other side from water damage from outside rain. The main difficulty in this room are the stucco walls and ceiling. 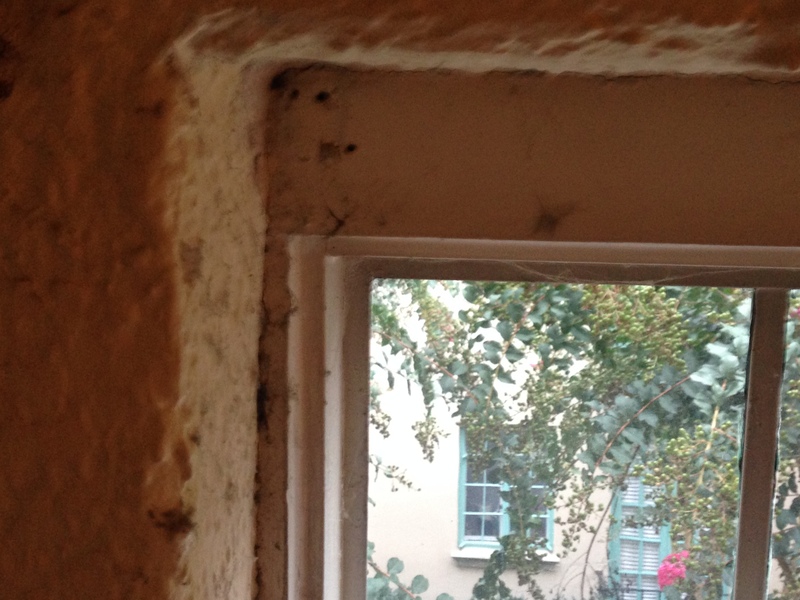 This means, most of all, dust and cobwebs everywhere. We began by spending half an hour using a damp mop to dust the ceiling. 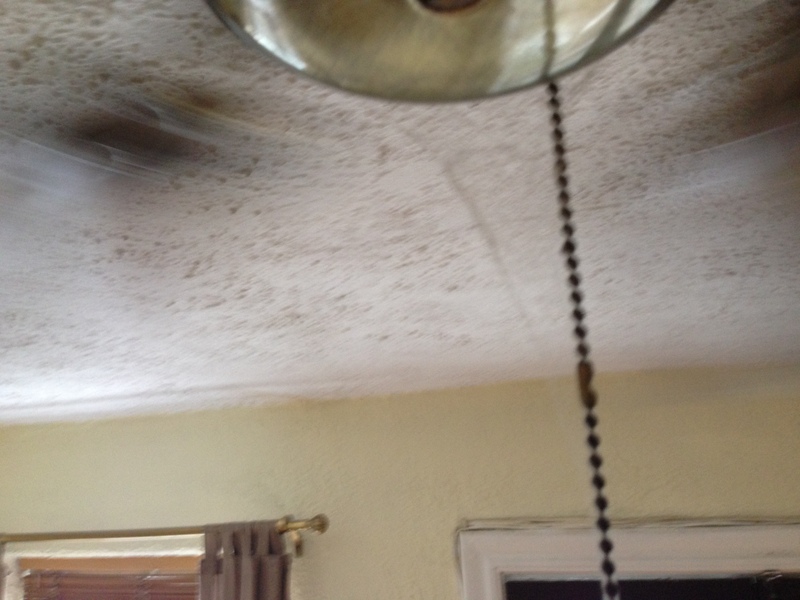 This didn’t work very well–so we spent another 1.5 hours vacuuming the ceiling. This ALMOST did the trick. Secondly, the stucco makes it difficult to paint–there’s much more surface area, and without a sufficiently long nap you can’t get into all the spaces. 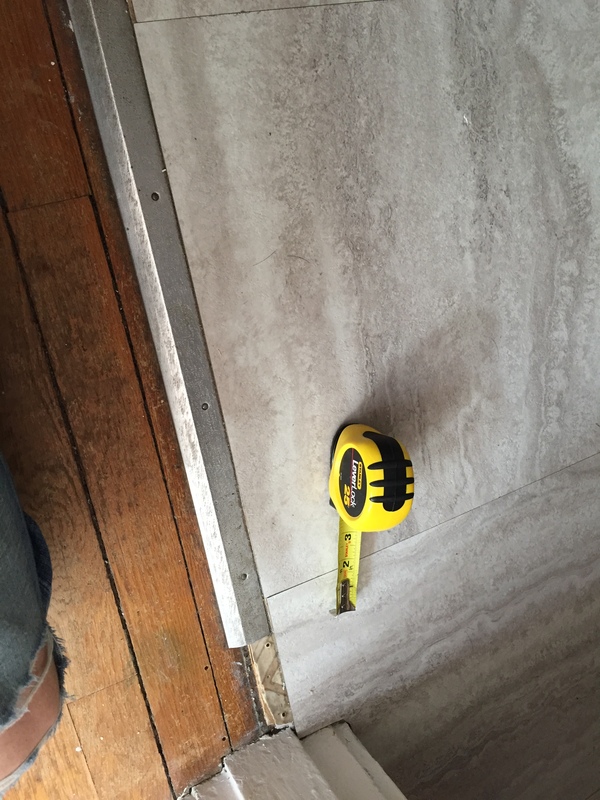 Ultimately, we used a stucco/concrete roller, with a nap designed for the purpose. 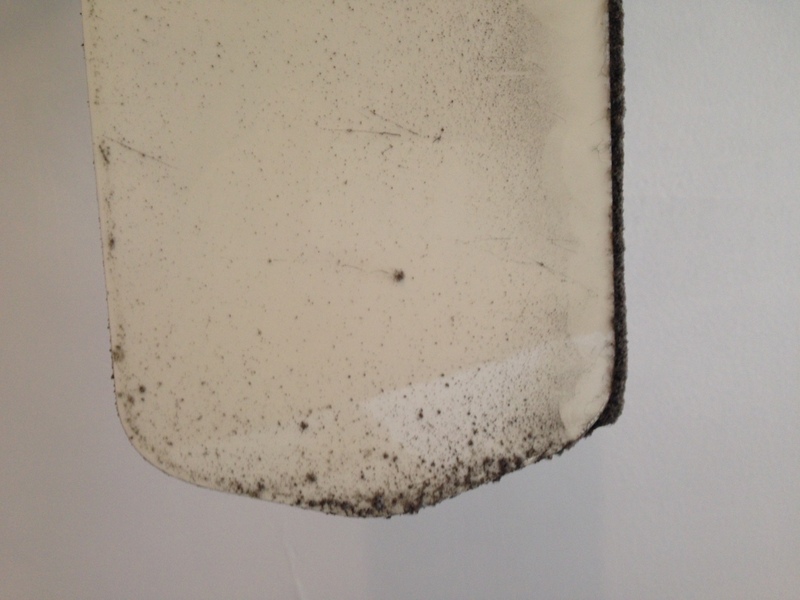 This before/after of the sconces provides a great example of the level of dust we’re dealing with. Fire hazard? 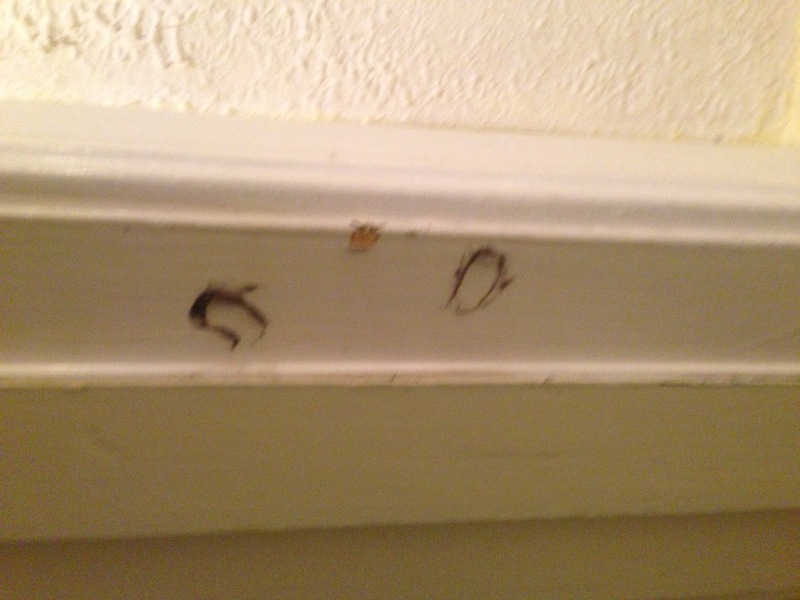 Here’s the top of the front door–what are these? Looks like leftovers from old spider egg pouches. Pretty nasty. We removed all the window dressings, painted the walls Sherwin Williams ‘Requisite Gray’ and while we intended the trim to be ‘Eider White’–we mixed up the paints and ended up painting the trim just plain white. But, the truth is that we’re thrilled with how it looks. 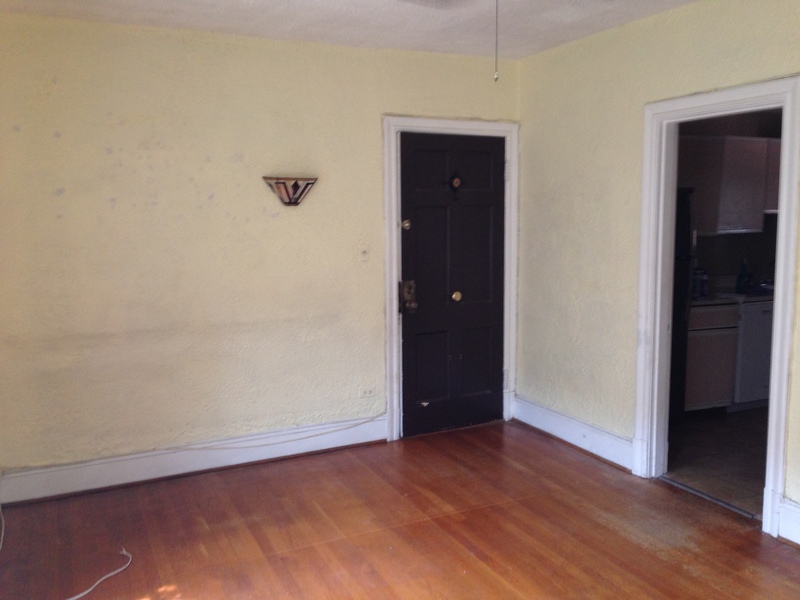 Between the kitchen and living room, the transition didn’t go all the way across. I’m never sure how to read this bottom part of the measuring tape, but it sure looks like half an inch of kitchen flooring layers here. We cut it too long, and I spent a good half hour getting intimate with a piece of sandpaper, but finally, it fits perfectly. We’ve decided to leave the center entirely open, which gives us more space to play with Spooky. Also, we have no plans to add window dressings for the time being–if any, then sheer–because we like having so much light. 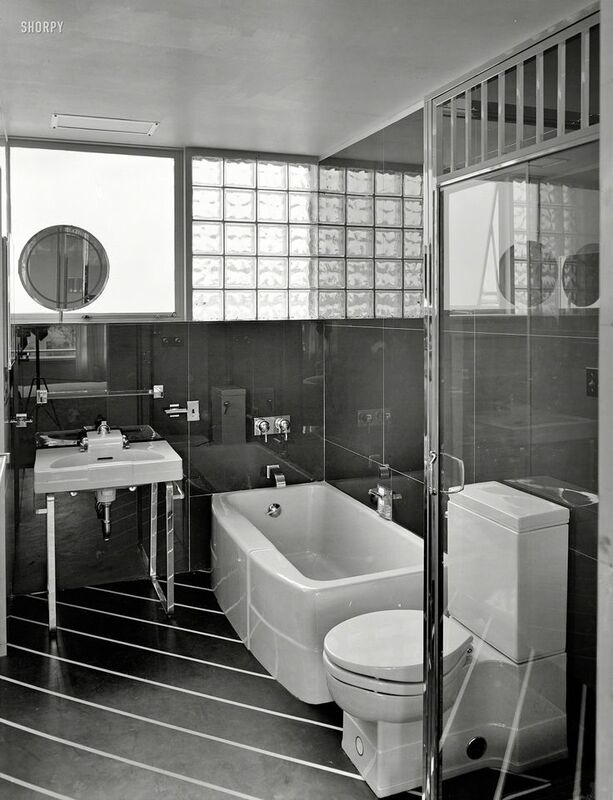 In 1928, the year our place was built, people didn’t bathe as frequently. What this meant was that nobody ever build proper ventilation into the bathrooms here–and there’s no way to do so either…at least not without risking electrocution at every turn. Why does this matter? 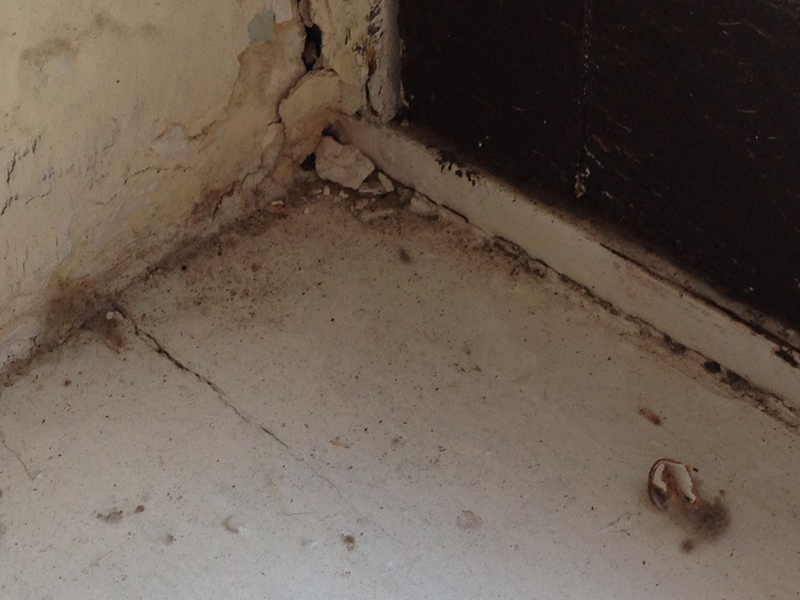 Because the moisture can’t escape and it makes the walls get moldy and rot. So my first task was to figure out how to get the window open. 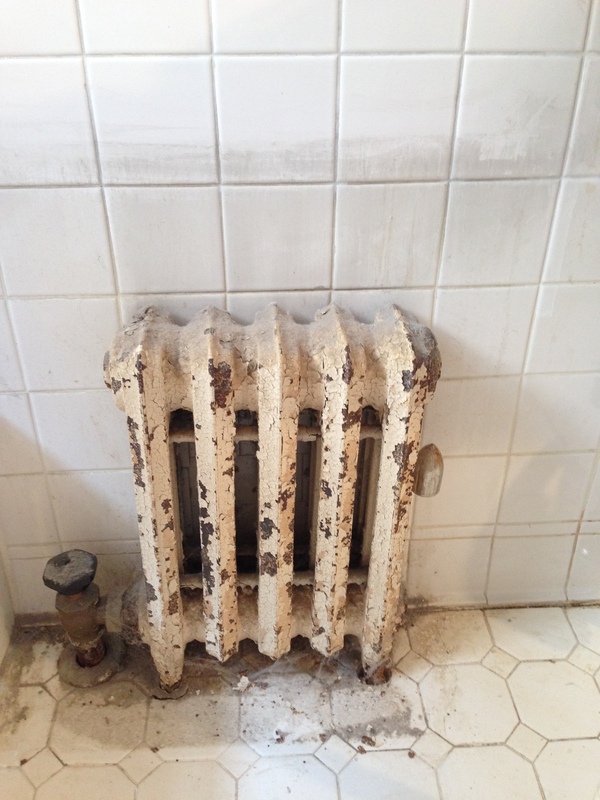 After hammering out the places it was painted shut, I finally had no choice but to pry it open–which worked! 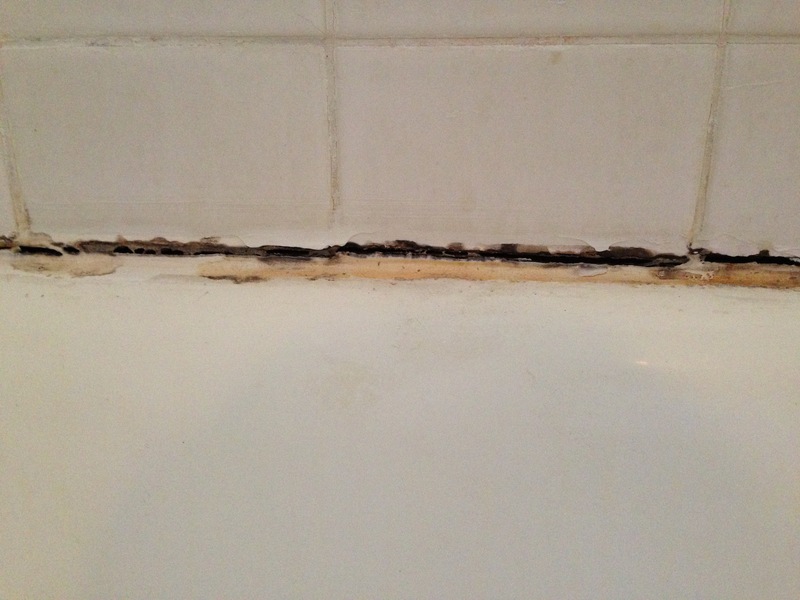 The bathtub has places that, from the looks of it, were previously patched up, but have since become messed up again. 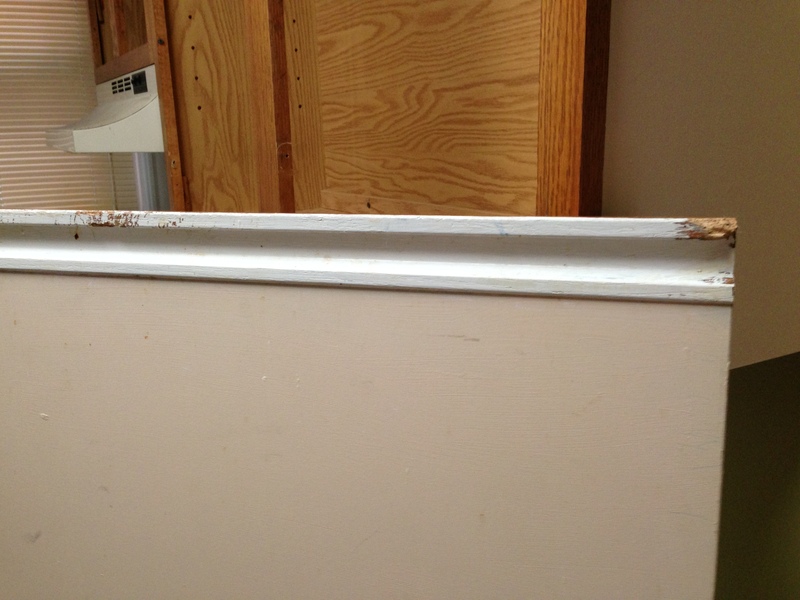 You can see the old repair, the top coat, and whatever the bottom is. 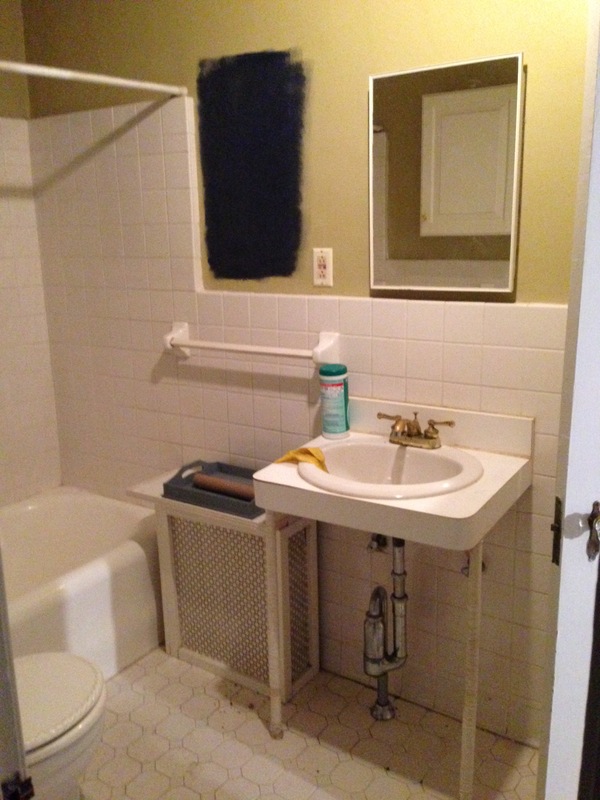 Because it’s not black, we assume that we’re dealing with a fiberglass tub, rather than a ceramic one (which would be coating iron, or something). 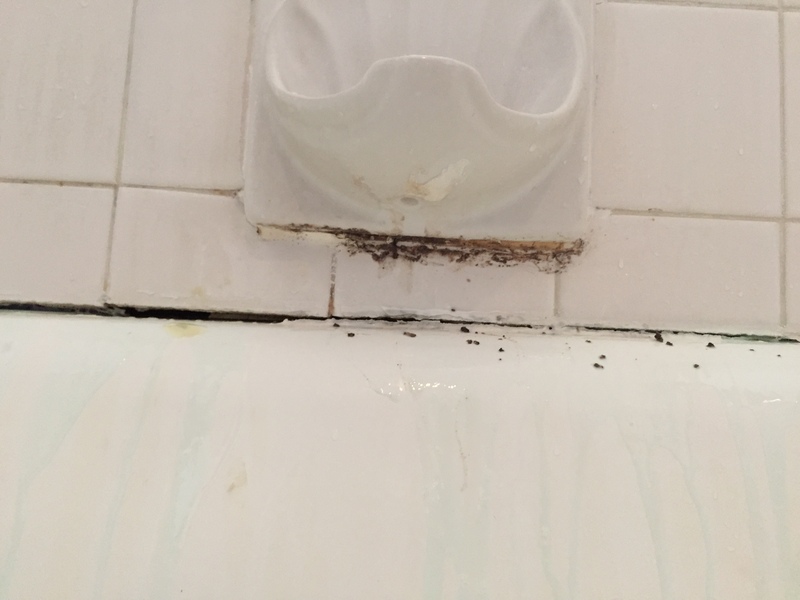 These spots were all over the tub. And the tub was pretty yellow and filthy, as you can see. 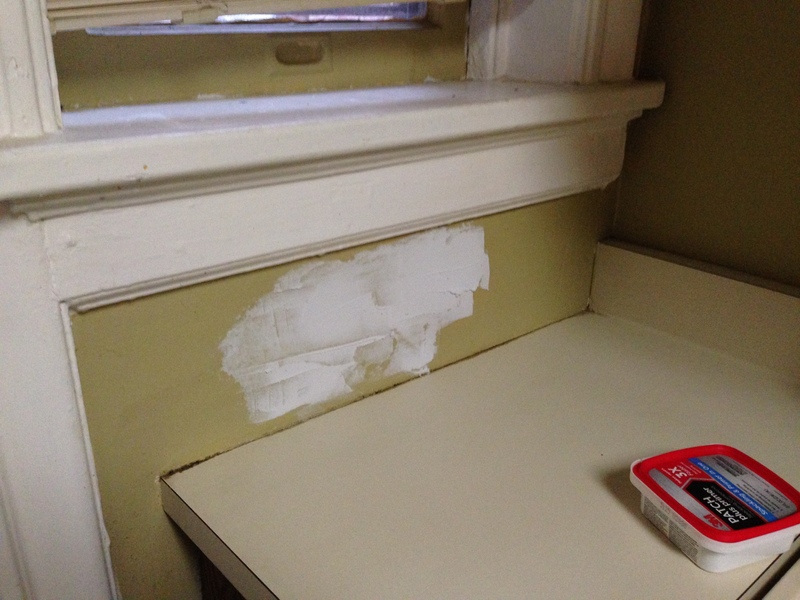 Next, since it looks like there’s some mold underneath the caulk, I cut it out. 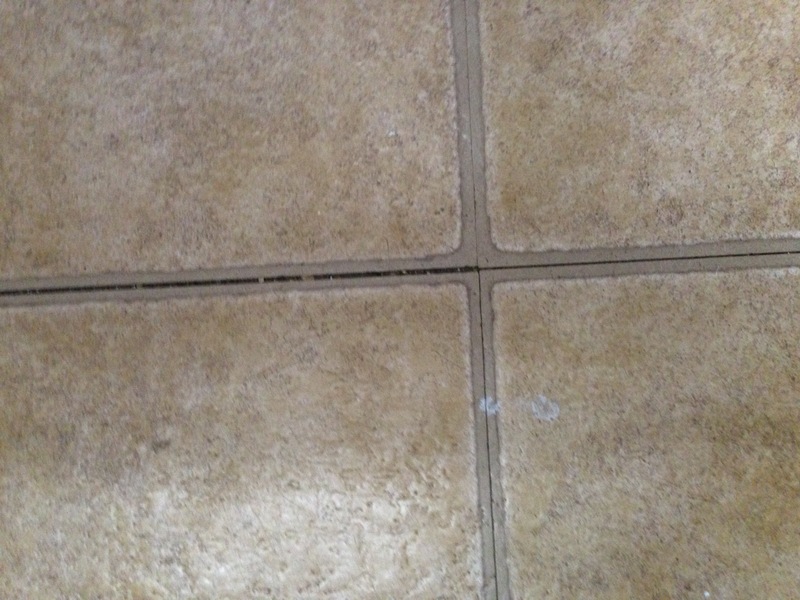 To get the caulk between the tiles white again, I used the strongest bleach gel I could find (for toilets), which you can see dripping into the tub here. 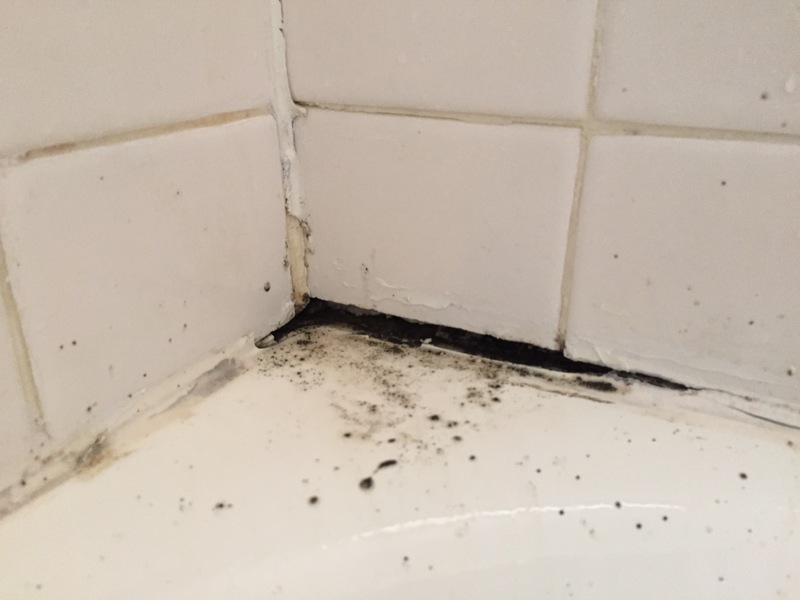 The black stuff is mold that’s come out from behind the caulk. Here’s some closeups from before I began spraying the stuff out from the cracks. 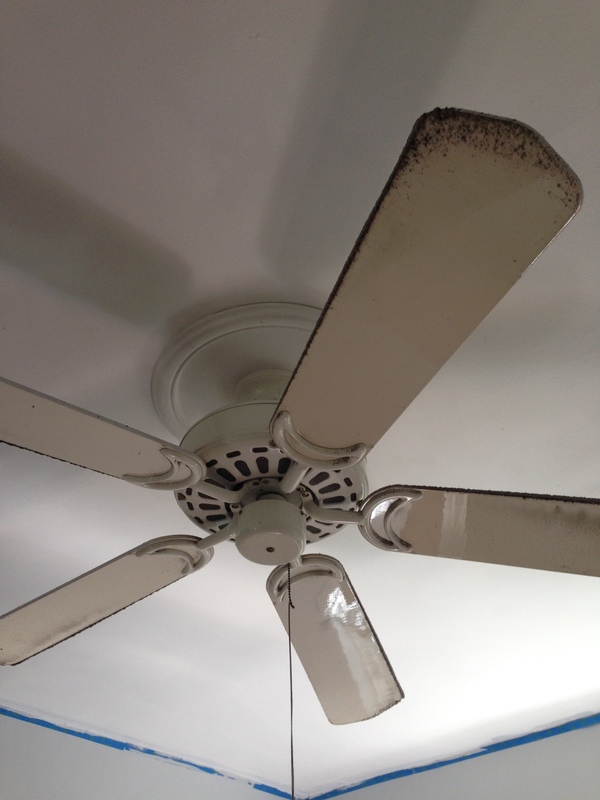 I used bleach and mold killer to get rid of the black mold, with plenty of irrigating, and then used a hair-dryer on high heat. 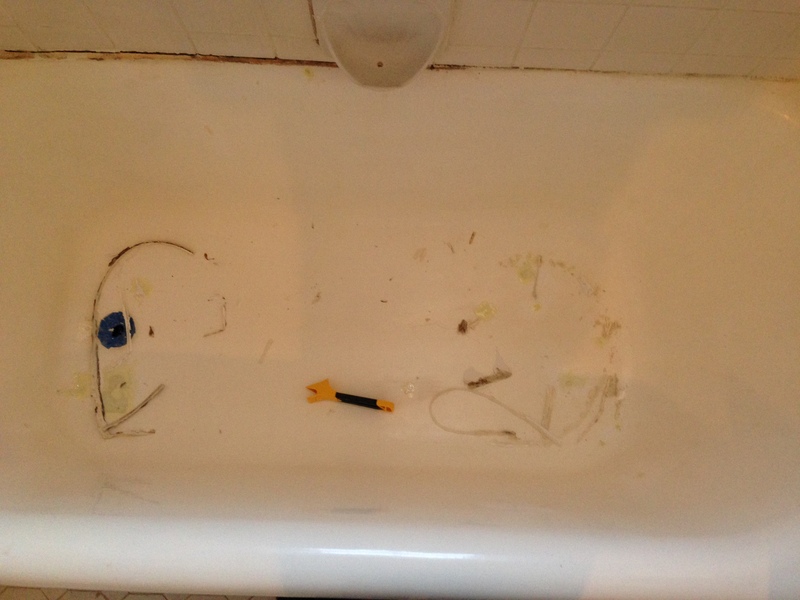 You can see in the following photo a bunch of yellow spots–pretty nasty–but they’re fiberglass patches for the tub. 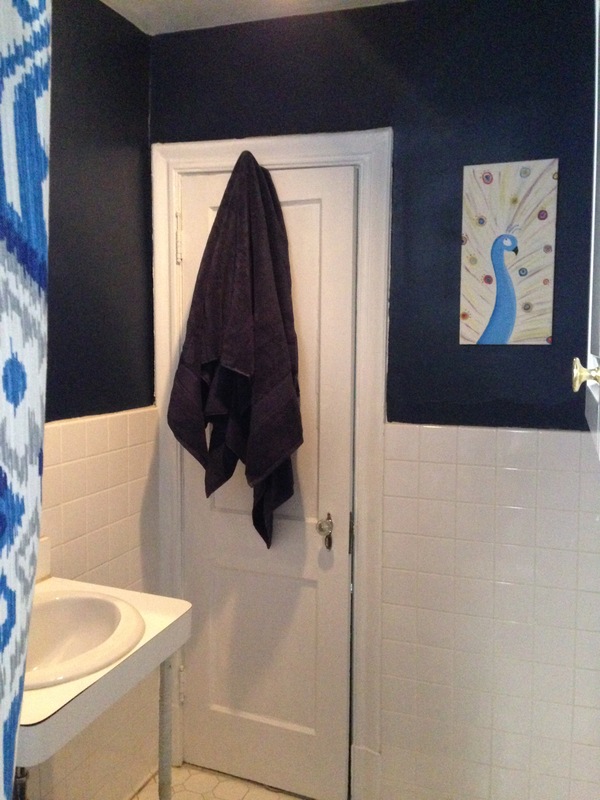 Do you see this giant black spot painted on the wall? That’s the color we’ve decided to paint the walls. Seems like the worst idea ever. 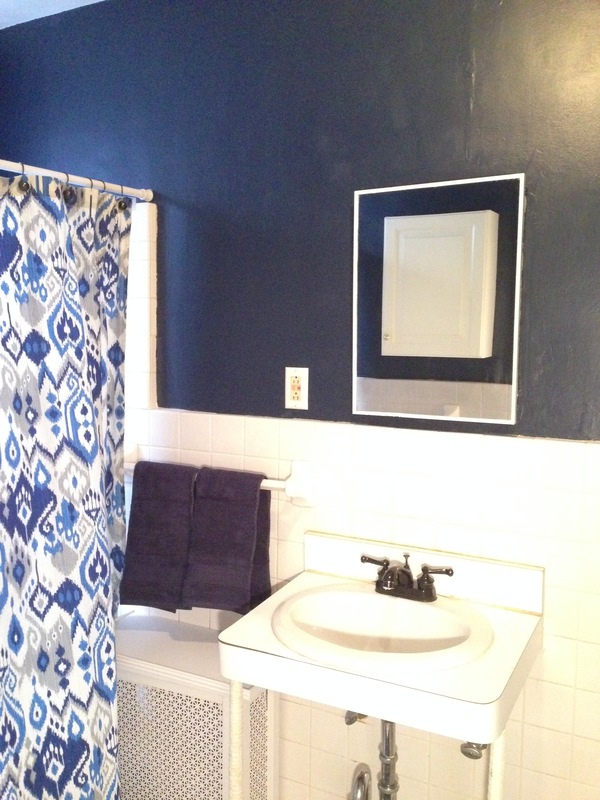 It’s Sherwin-Williams “Naval” and we’re convinced that it’ll look great surrounded by all this white. Anyway. We painted the walls, as planned, using “Naval” and “Eider White” for the trim. 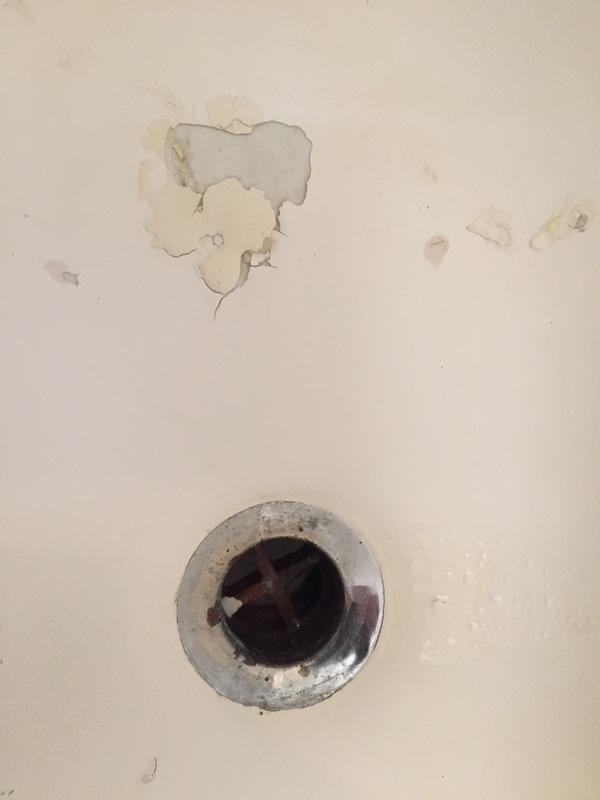 We used leftover metallic black spray paint from the kitchen to paint the sink hardware, which was a brass that was too far gone to shine back to its former glory–also, it had left green discharge all over the counter and floor. 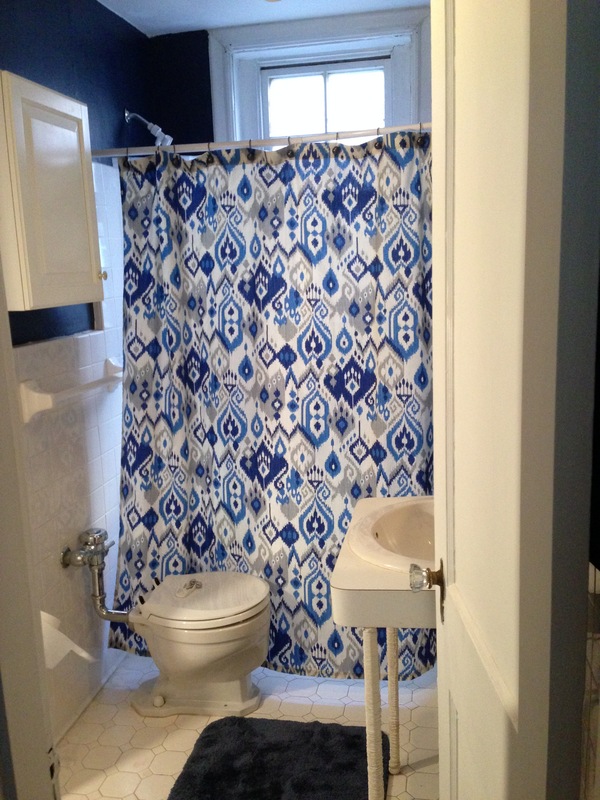 Our old shower curtain still worked, and we received a gift of the towels and rug–everything fit together pretty nice! 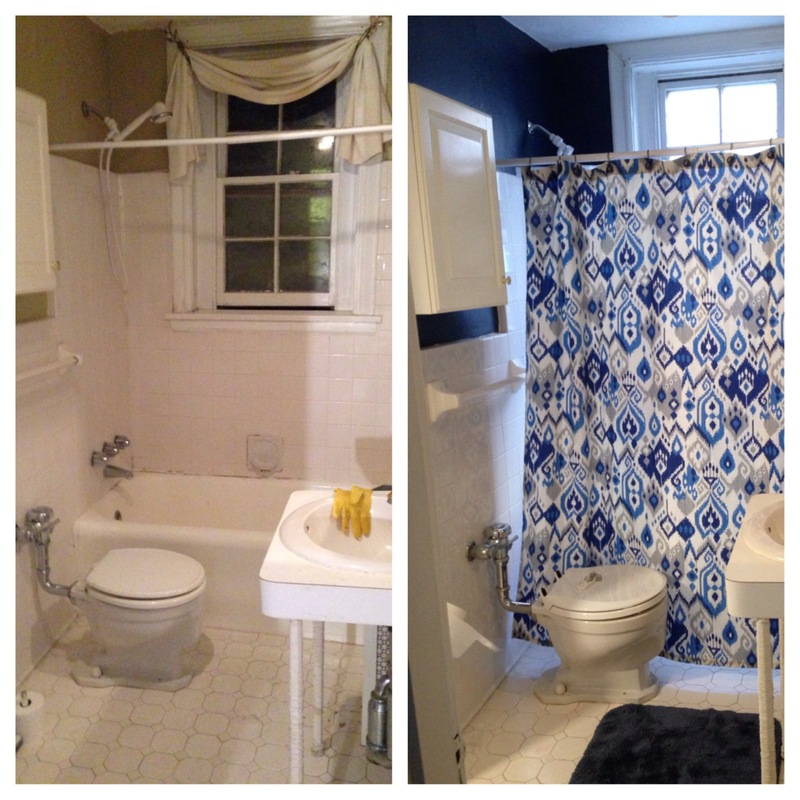 New toilet seat, and a good scrubbing in general, and finally re-caulking the tub and the sink. Last update: Sept 13, 2015. What’s taken up the most of our time has been cleaning. 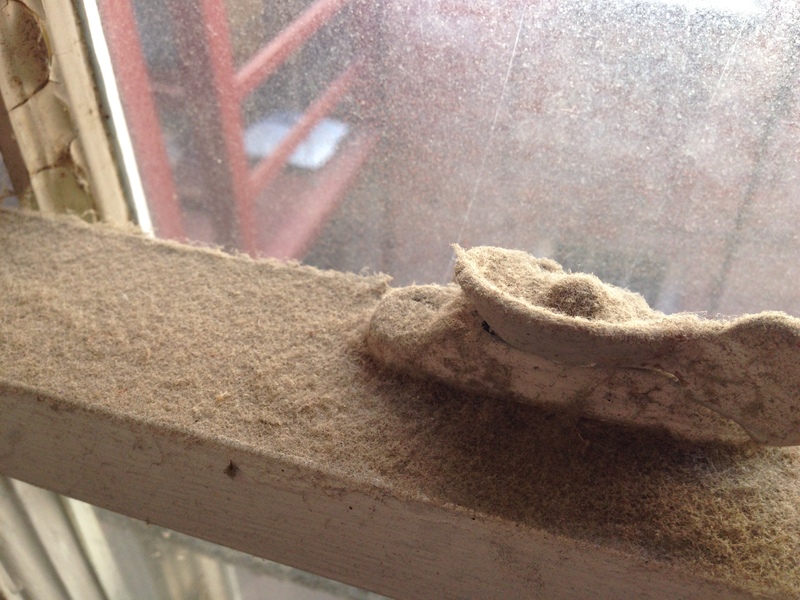 If it was just cobwebs or stuff we could vacuum it’d be like cleaning a place normally…but there’s a layer of filth coating most things in the apartment, sticky stuff, a lot of dog hair in the fridge, mouse turds, right down to the toilet seat and fan blades. So, here’s some pics. 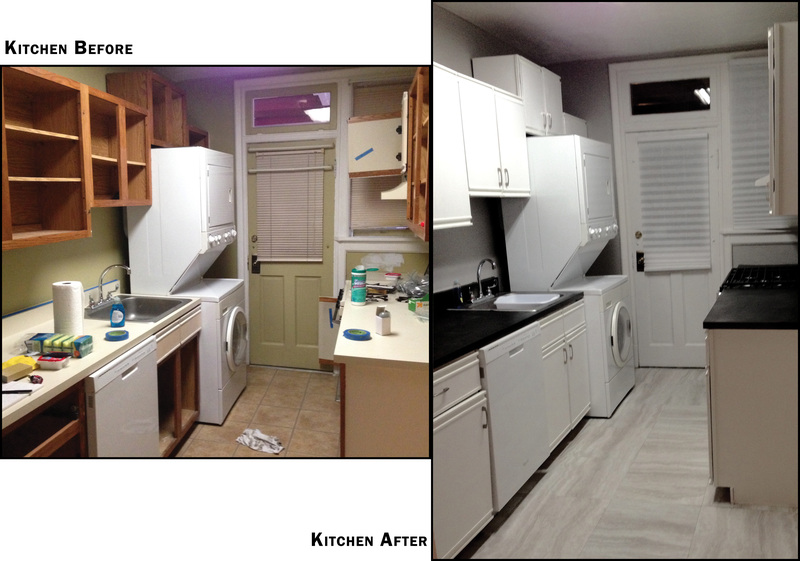 The kitchen is probably the hardest thing to get right–so we began with it. The walls are maybe an avocado green, and the melamine cabinets have what looks pink, but may be more on the “flesh” side. 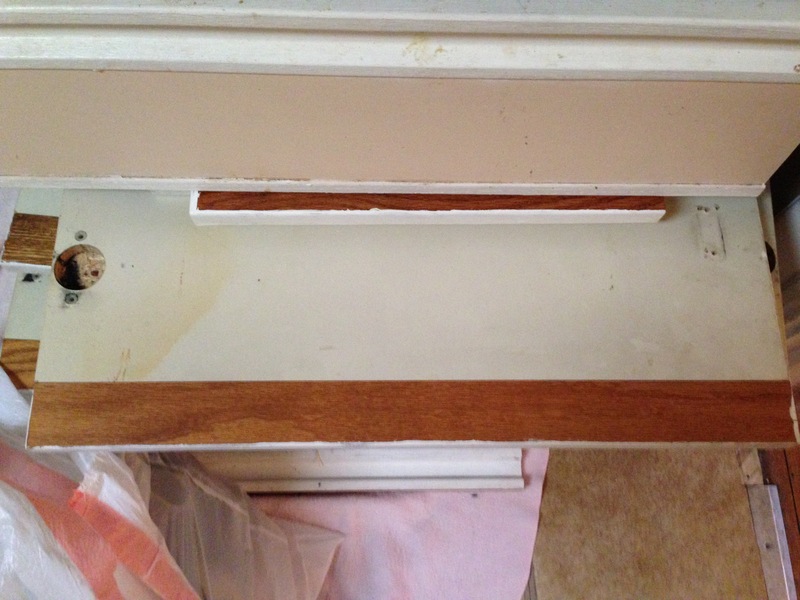 The original wood is painted white on the trim, and left natural on the cabinet faces. The laminate countertops are an off-white. Just for the record, do green and pink go together? 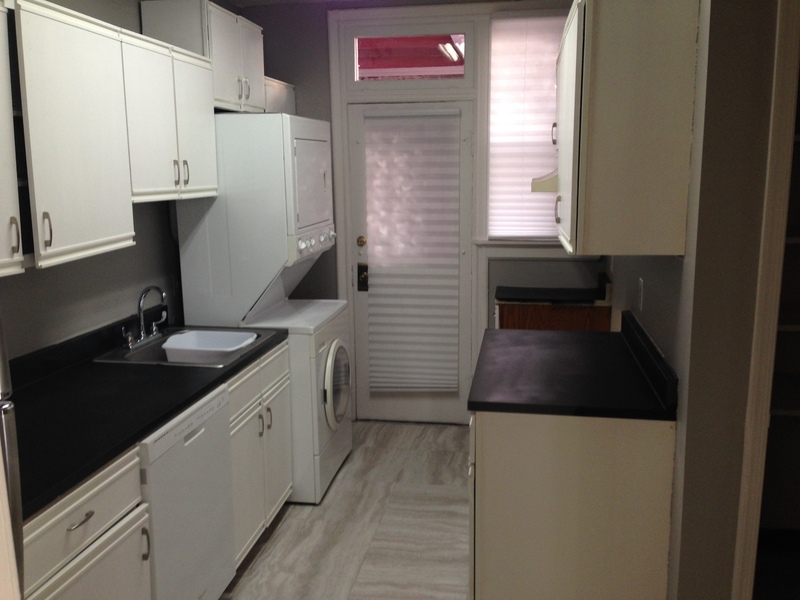 Actually, yes–it’s a mid-century modern staple, as seen in this image of the Samantha and Darren’s laundry room on Bewitched–notice the white trim on the “flesh” (or natural wood?) cabinet doors also. But, as I spent 99% of my time in the apartment since I both work and live here, I’d like it to feel brighter and more open. First, we filled the cracks (and in one case, a large hole behind the oven). 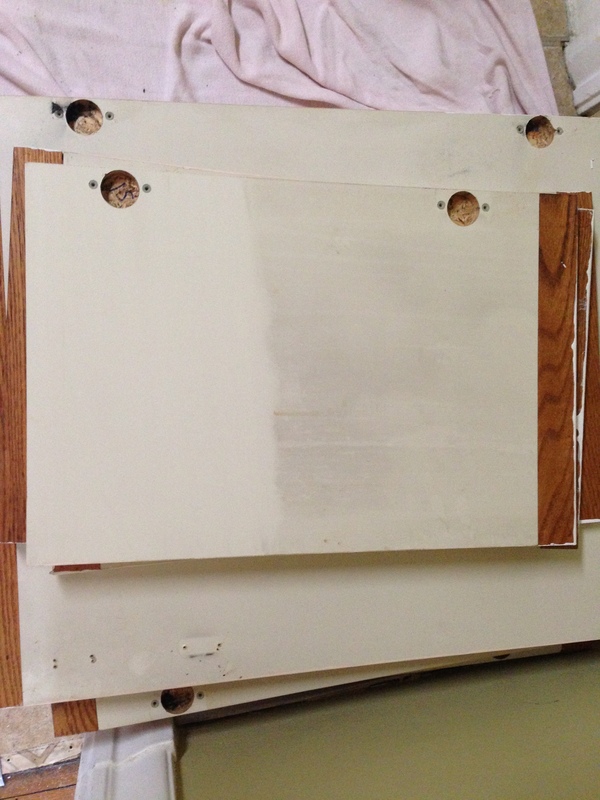 Next, we began painting the cabinets white using the Rustoleum Cabinet Transformations kit. It was on sale for less than half its usual cost. We removed the window blinds and since we hadn’t figured out what the new blinds should look like, we covered the windows with privacy film that we leftover from our old apartment and that we nabbed from my parents. 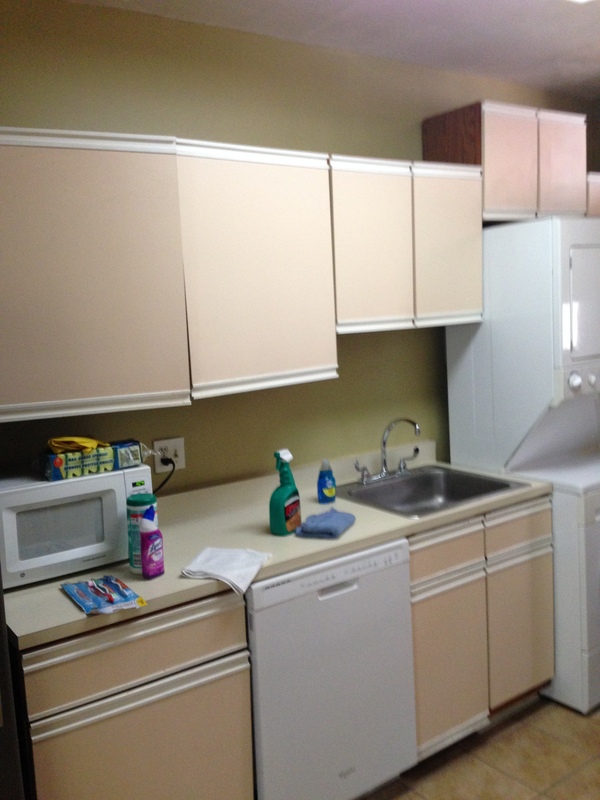 We painted the cabinet doors as well as the cabinet facing. 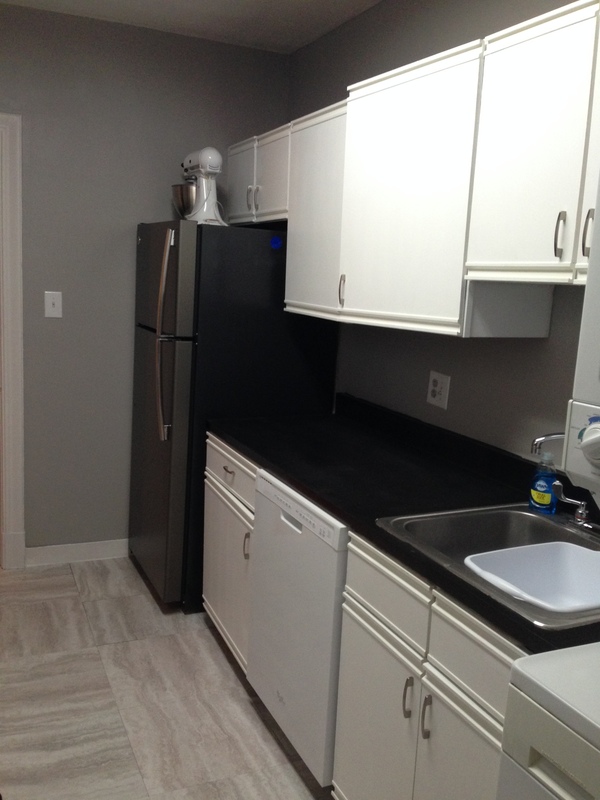 We then began repainting the walls in Sherwin Williams “Requisite Gray” and painted the countertops with four coats of Rustoleum Universal Metallic Spray Paint in “Dark Steel”–which, while it looks black here, actually matches the color of the fridge and has a car paint sort of look to it. We then sprayed three layers of Polycrylic glaze as a topcoat to prevent flaking and chipping. 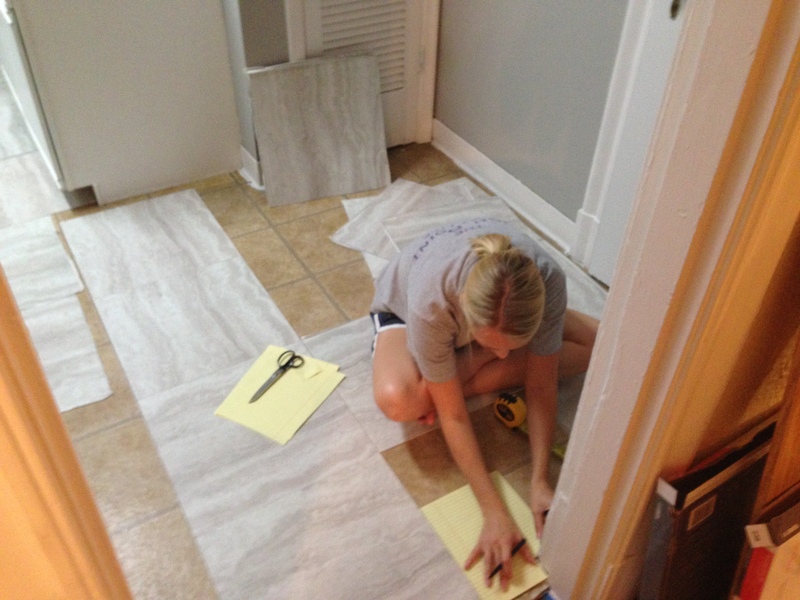 After finishing painting the walls, and then painting the trim with Sherwin Williams “Eider Gray”, the thing that really stood out as out of place was the floor. 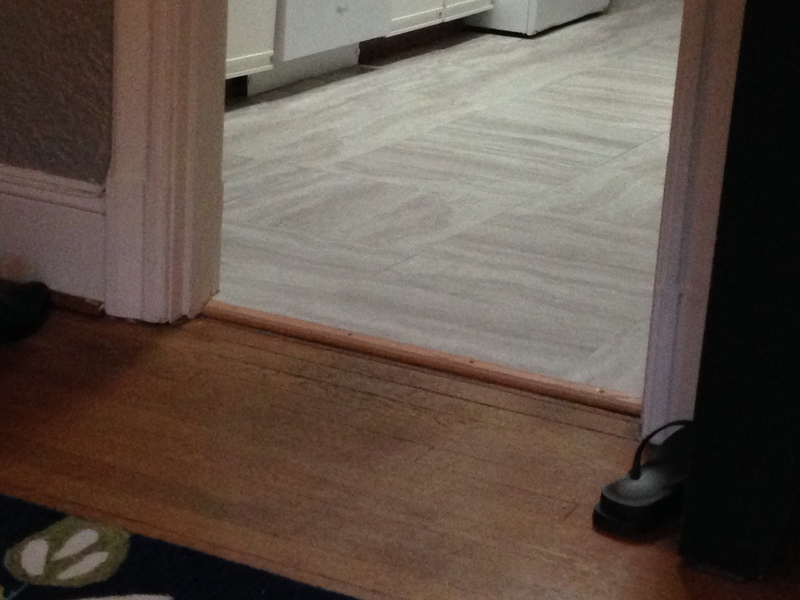 After doing quite a bit of research, I decided that the only thing that would do would be a whitewashed pine floor. So…being flexible, how about Pergo? While we have a 4×4 foot section of Pergo in our apartment for the dog, I can’t imagine sawing it to fit the kitchen properly. 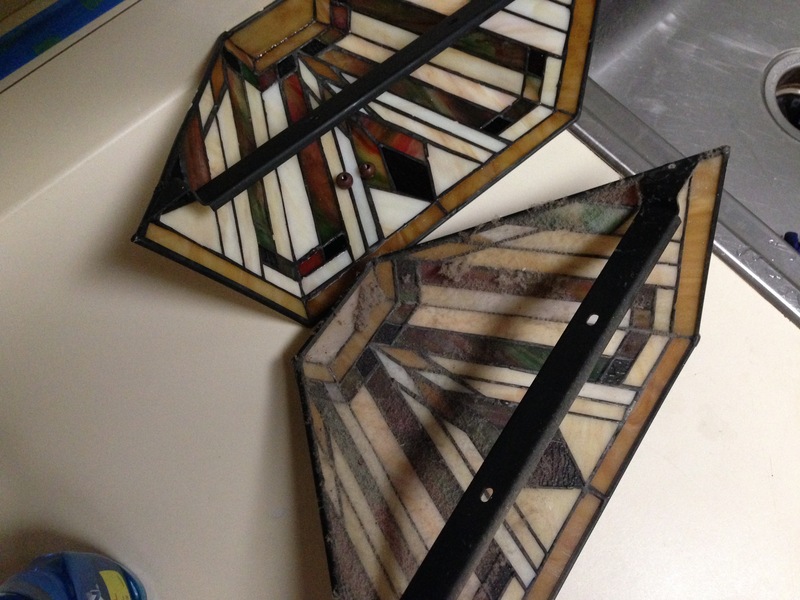 So, peel and stick tiles seemed to be the way to go! We chose the only ones we could find that were a white-ish color and still looked natural (stone). I gave up pretty fast, but Cindy kept going until we finished at 3am. 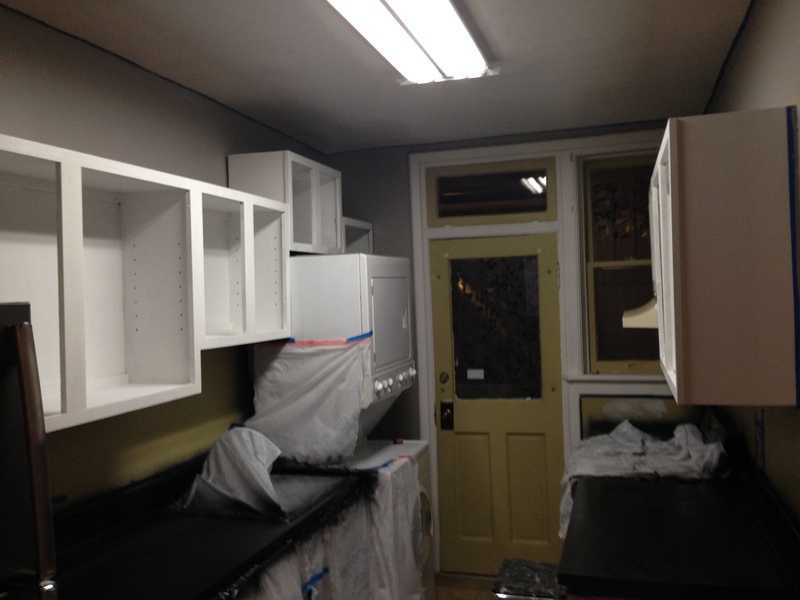 I kept working on the cabinets–also till 3am. And then we ate a breakfast, watched a few episodes of Friends…and here’s what it looks like when it’s finished–also the painting is done. 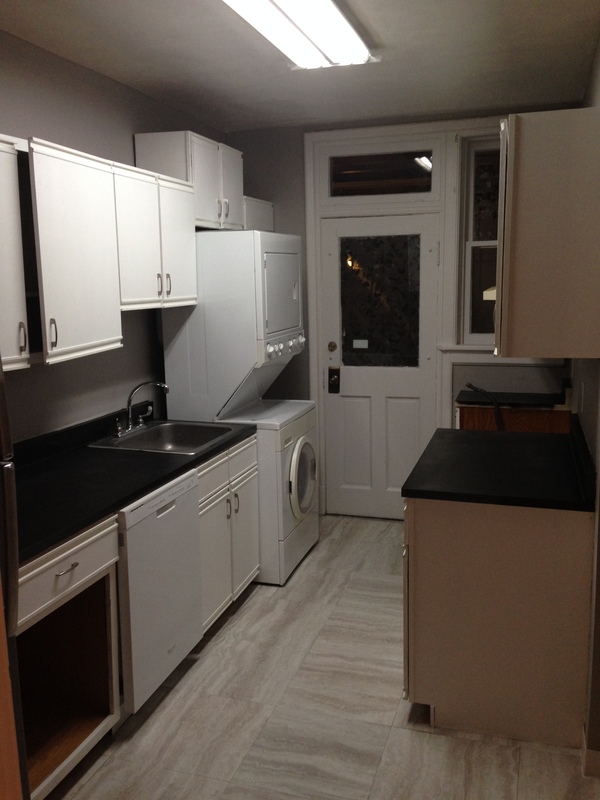 While the cabinets on the right look not white, that’s actually just the shadows–it’s white. Also, you can see that at this point, the old oven has been removed while we wait for the new one. Lastly, we hung new blinds. 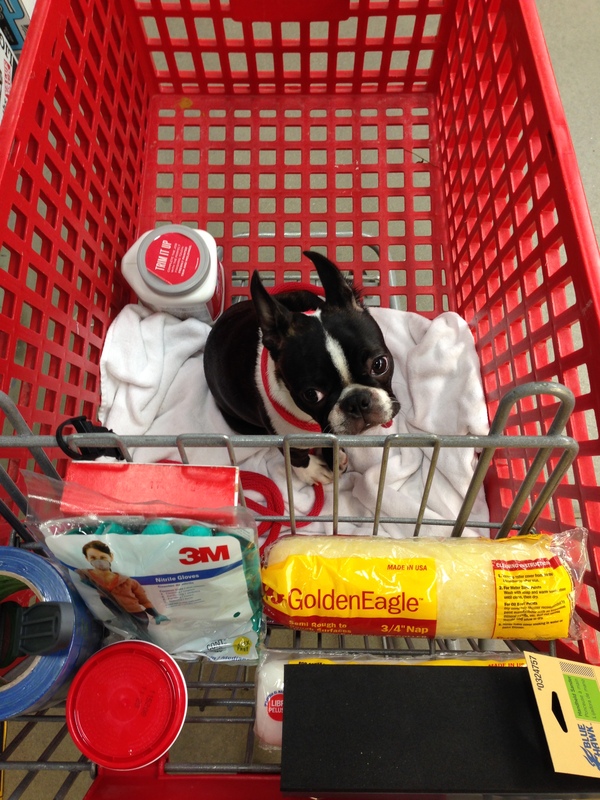 We were hoping to find gray, but all the stores sell are in white or tan–so, white it was! You might notice that the same cabinet door is cracked open in both photos, like the kid on the soccer team whose mouth is always hanging open. So far, it’s proven impossible to get the magnets to hold the door shut particularly well. I’ll figure it out. 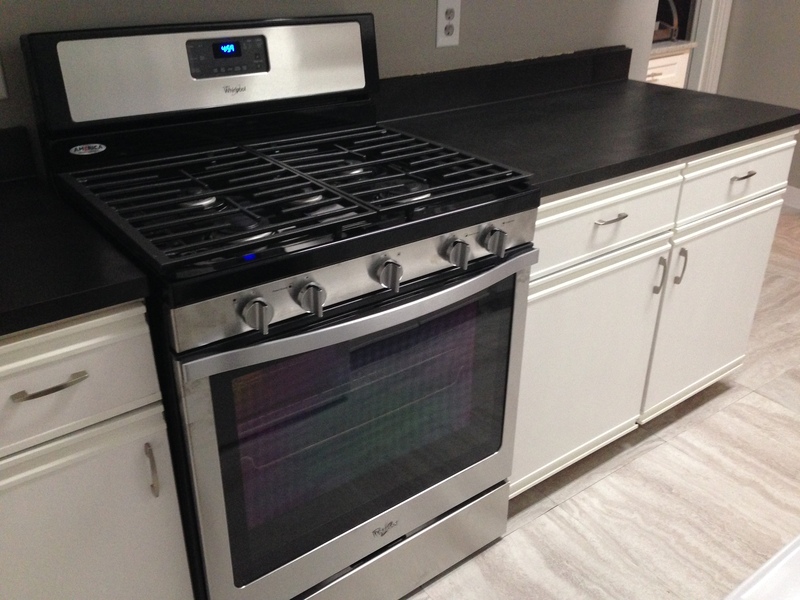 From there, we were fortunate enough to have a new oven/stove installed. How old was the last one? I don’t know, but I found a theatre program/playbill from 1984 underneath it. At first I thought it was broken, but actually it just took a while for the ignitors to work. The new one, we anticipated, would be in metallic gray and black, so we were hoping that the rest of the kitchen would match it. Behold! We’re pretty thrilled about how it’s turning out. Lastly, where are we going to put this giant microwave? We’re generally using all available countertop as we slice and dice our Blue Apron meals each night–three burners and the oven going, etc. etc. We put the current microwave into storage and bought a new one–the smallest one they sold at Target. 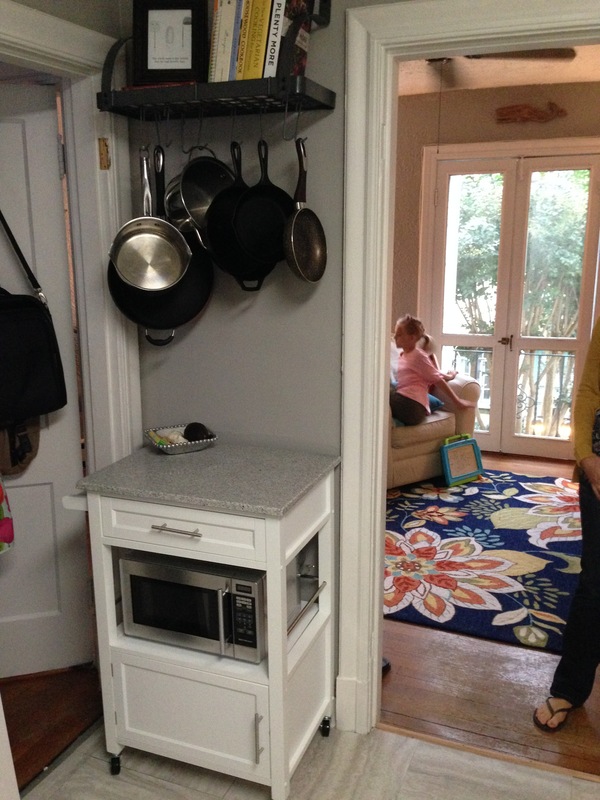 We put together an “island” cart with a heavy granite top, and hung a pot rack on the wall above it. Where we’re at: the kitchen closet door, and the door between the kitchen and bedroom, we need to saw off the bottoms of them and re-hang them, because right now they’re not fitting over the new flooring, and also because the bedroom/kitchen door has a strong smell of poop…which makes sense to some extent, since it’s where the previous owner’s dog lived for three years. But in any case, we’re all ready to begin moving stuff from our old kitchen to our new one! 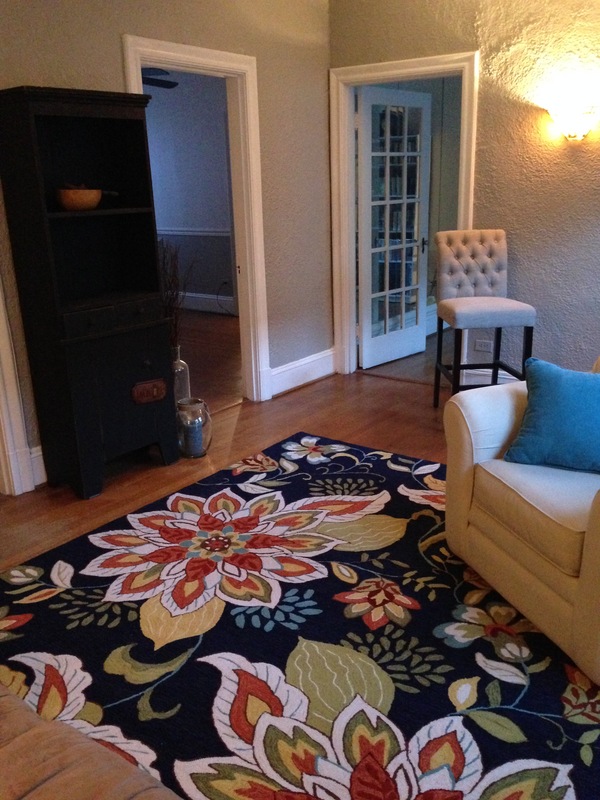 As you can see our new finished living room in the background, it’s time to take a look at how we did the living room. This isn’t strictly true. 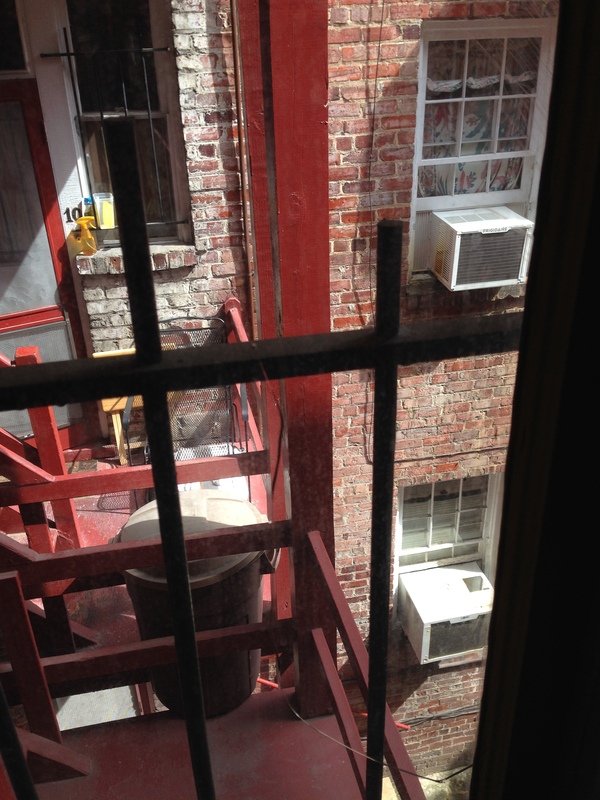 Barbara told us we’d probably get kicked out, but there’s a 200 pound dog living across the hall, and another eight living in our quad–so we thought maybe the chances were slim that our landlord would care. I mean, his other tenant has kids. Anyway, he said ‘you can’t have a dog’ and I said ‘she’s not a dog–she’s the daughter of two champions, and we have her living in a 4×4 cage with Pergo flooring, and she doesn’t bark, and she’s only 10 pounds. She’s a Boston Terrier, which means she was bred for city life.’ It took him 3 weeks to get back to us on his decision, but by then we’d found a new place. So, we’re moving. And we’re allowed to touch it up to make it feel more like ours, which is pretty exciting, since where we’re living we’ve had to velcro everything to the walls. So today we got the keys and did a walkthrough with the landlord.